I know. It's been forever since my last recipe post. I do apologize. Things have been crazy around here. After going to California for two weeks to visit family and coming back and being behind on the blog, my recipes and DIY posts have been put on the back burner. I know there are a few of you out there that come here for more than the giveaways, so my bad. Okay, Spring you guys, it's here! I'm super happy, this means we're one step closer to Summer and I can't wait for some warm weather. I have to give it to Spring though, last week was pretty awesome. We took out our patio furniture from the shed, the bikes, scooters and skateboards for the kids to ride and have been having so much fun out doors. It's been great. We even had great weather for Easter. I had Easter at my house this year because it fell on my mother in law's birthday and both my sister in laws and I thought it would be great for her to have this Easter off so she didn't have to cook. She had a blast! Along with Easter dinner came dessert. She loves lemon anything, so I decided to make her some yummy lemon cupcakes. I wanted to try something different so I got my lemon cupcake recipe from The Non Blogger and my Lemon Buttercream recipe from Taste and Tell. Together the cupcake and frosting turned out delicious. 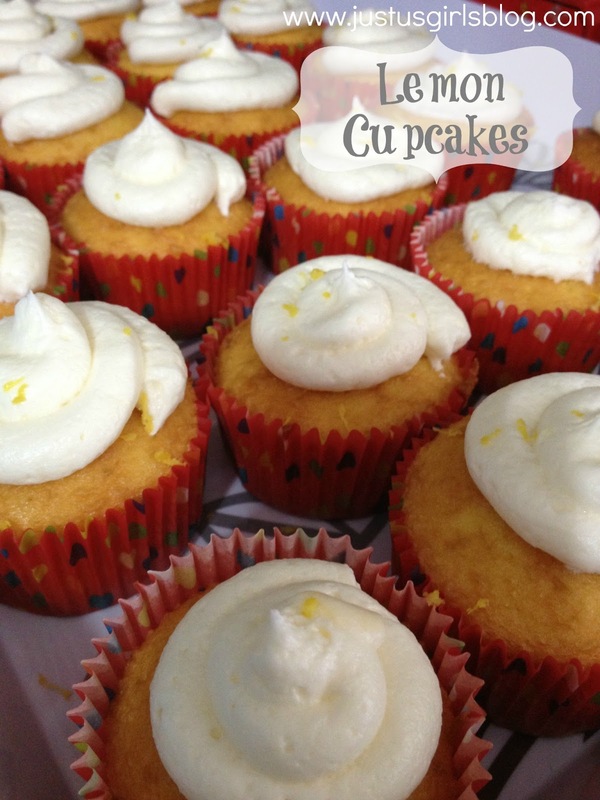 This will definitely be my new lemon cupcake recipe to go to, it's perfect for Spring. Enjoy! Preheat your oven to 350 degrees F. Line cupcake tray with 12 cupcake liners. In a medium bowl, cream sugar, butter and lemon zest. Beat in eggs one at a time, then stir in the vanilla. Add the flour and baking powder to the wet ingredients. Then squeeze the juice of two lemons into a measuring cup and add enough almond milk to make up 1/2 cup. Add this to the mixture and beat until mostly smooth. Scoop your cupcake mixture evenly in your tins and bake for 20-25 minutes, or until a toothpick inserted in the center of a cupcake comes out cleanly. Mix and cream the butter in a bowl. Then add salt, lemon juice and lemon extract. Add in the powdered sugar, half a cup at a time, until you reach your desired consistency.